Martian Road Trip: A Three-Year Journey at 0.00037 M.P.H. Missions to Mars rarely go as planned. In some cases, that's a bad thing: from 1998 to 2003 alone, NASA's Mars Climate Orbiter and Mars Polar Lander, Japan's Nozomi (Planet-B) and the British Beagle 2 spacecraft were all lost on arrival at the Red Planet. Just as often, though, things go the other way. Mars orbiters, landers and rovers have a pretty remarkable record over the past four decades of performing a lot better than their designers ever imagined. Even so, it will be tough to top Opportunity. When the dune-buggy-size, six-wheeled rover crawled out of its mother ship way back in 2004, NASA engineers were counting on it to function for just three months, if nothing went wrong. But this week, after nearly 8 years of tooling around at an average .00037 m.p.h. 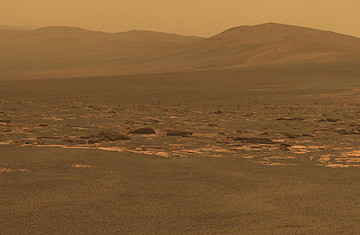 and covering a bit over 20 miles, Opportunity has just arrived at its latest destination: a crater named Endeavour, where scientists think there may be new evidence of the Red Planet's soggy  and thus, perhaps, life-friendly  past. The search for water has been a major focus of Mars exploration all along. One probe after another over the years has looked down from orbit to identify ancient riverbeds and shorelines all over the planet, and just last week scientists reported that water might still flow occasionally on the planet's now arid surface. Rovers, meanwhile  including Opportunity; its twin, Spirit, which gave up the ghost last year; and Sojourner, which roamed the planet in the 1990s  have all found mineral deposits that almost certainly formed in wet conditions. Opportunity has already descended into one Martian crater, named Victoria, to look for evidence of water in subsurface rocks exposed when a huge meteorite smashed into the planet in the distant past. Before it went in, the rover spent a year cautiously driving around the rim of Victoria, looking for the safest way in. It spent another year inside, and then, when engineers detected a possible problem in one of its wheels that could have trapped it there forever, it crawled back out again. Now three years and 13 miles later, Opportunity has arrived at the crater Endeavour  by chance, it has the same name as the last space shuttle, which flew its final mission last month. At 14 miles across, Endeavour is more than 25 times bigger than Victoria, but that's not what has planetary scientists excited. They know from sensors aboard the Mars Reconnaissance Orbiter, orbiting overhead, that some of the minerals inside the crater contain clay. No Mars lander or rover to date has had a closeup look at Martian clay  and because clay forms in the presence of water, Opportunity may soon get a look at yet another piece of evidence from the days when Mars was a less barren place. Indeed, among the many competing theories for how life began on earth, one holds that it happened in beds of clay. Nobody is predicting that Opportunity will find signs of life, ancient or modern, inside Endeavour, of course; the search is simply for evidence that Mars could at least have been hospitable to life, and the clues will be more geological than biological. And nobody will learn anything at all for a while since the rover will need to scout the terrain carefully before plunging in. But a few months down the road, scientists will get their best look yet at material left over from the days when Mars wasn't such a bad place to live. They will, that is, if Opportunity keeps on going. And given its performance so far, it would be foolish to bet against it. See pictures of evidence of water on Mars.